Your Magento 2 store’s theme is like a windows drapes which can be customized for a promotion or following season. Magento provides a vast of simple-to-use design options that you can use to create some simple changes in your web store. Furthermore, you will find more perfectly designed themes available on Magento Marketplace. On the Admin sidebar, tap Content . The Design sections are part of the Content menu, provide 3 control options: Configuration, Themes and Schedule. There are 3 option in the Design Menu Option: Configuration, Themes and Schedule. Each option controls an important part in customize design theme & menu in your Magento 2 web store. The Design configuration allows you to easily control extraordinary settings for each website, store and view in your Magento installation. 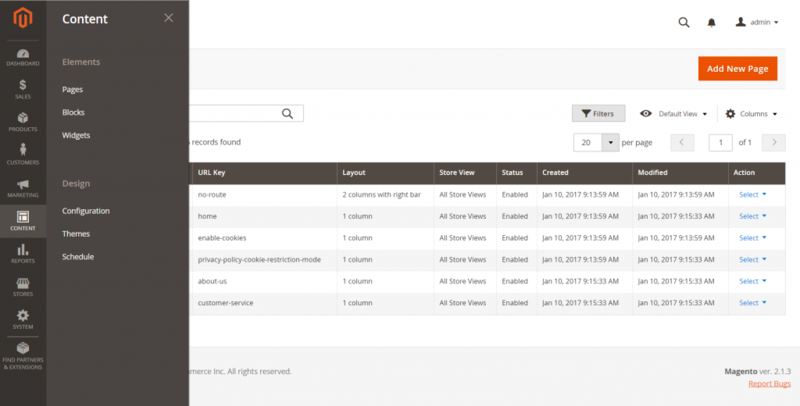 The Themes decides the visual introduction of your Magento 2 store, and comprises of a collection of layout files, translation files, template files and skins. Themes can be activated for a period of time, following a schedule. Use the schedule to plan theme changes in advance for a season or promotion. Above is some basic information about customizing design and theme in Magento 2. If you have some questions or more information, feel free to leave a comment or contact to our authors’s email. In the next article, we will describe detailed furthermore about Design Configuration and more important option in Design Menu. Keep watching our site and don’t forget to subscribe to read more Magento 2 guideline article.